Dear Audience, I warn you: this is going to be quite a wordy blog entry. It’s going to be insightful and helpful as well; you’ll see. Please, go on reading. In this post, I’m reflecting on the knowledge I gained and the skills I developed as I used web 2.0 tools to carry out five storytelling activities. In order to capture my thoughts and feelings as I was trying out each tool during the storytelling fortnight, I wrote the different sections of this post in instalments following a series of steps (process writing). But I decided to put off publishing the whole entry until the digital literacy fortnight was over. 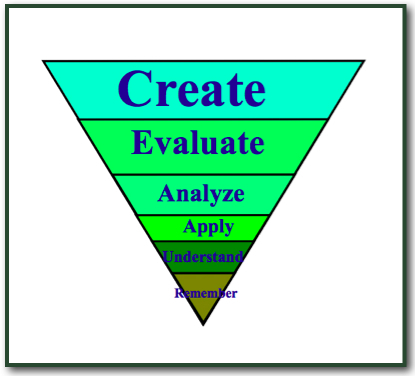 I wanted to connect digital storytelling with thinking skills (as described in Bloom’s Revised Taxonomy of Thinking Skills – my own agenda) and digital literacies (as discussed by Howard Rheingold and Doug Belshaw – last fortnight’s topic). My ultimate goal was to make sure new knowledge get well connected to prior one. I also revisited several semiotics sources. In the final section below, you’ll also find some ideas for activities and my unanswered queries about the topics. Writing six word stories is not as simple as it seems. Obviously, first of all, you’ve got to have the topic and the plot of your story. I think the most demanding stage in the process is to find the six key words that convey the intended message in your story. These words can’t be chosen at random. Unless you’re very witty, you’ll need to have a thesaurus at hand and… plenty of time to think! You can use the RAFTS below. All in all, a six word story is a very interesting activity that helps you develop HOTS (higher-order thinking skills). Basically, you have to synthesise your focal idea in six words that trigger off a given interpretation and evaluation on the reader (Visit Educational Origami and learn more about Bloom’s Revised Taxonomy & ICT Tools here). A little trick: use visuals. These will lead the reader to understand the text in the intended way. But be careful with the photos you choose; the visual semiotic mode has its own grammar (i.e. roughly how what is depicted in images is combined into a coherent, meaningful whole). If you are interested in how to read images, check out this untitled paper here, this review of Roland Barthes’ Image, Music, Text. "The Photographic Message" here and Daniel Chandler’s Semiotics for Beginners: Modes of Address here. I posted my two six word stories on my blog and on Six Word Stories site. Besides, the stories can be posted on Twitter and collected to be remixed on Storify, which can make the writing process more collaborative and creative. In this activity, I explored how the non-stop iteration of a carefully chosen scene helps you emphasise the message conveyed through a given action. That is, you draw the reader/viewer’s attention to that action and the repetition of that action adds something to the original meaning. So the animated GIF enables you to somehow change the point of view in the original story. This is the video clip out of which I made the animated GIFs. I picked out two related scenes from a late-‘70s TV series in which physical and psychological violence is shown. The fast iterative movements in the animated GIFs make violence even more salient. Maybe, this is so because the scenes were de-contextualised from the video and re-contextualised into another setting (my blog post) to fulfil my purposes. You’ll find more relevant information about reading images on TV shows in Stefan Herrmann’s Do we learn to ‘read’ television like a kind of ‘language’? (2000) and in Daniel Chandler’s The 'Grammar' of Television and Film. 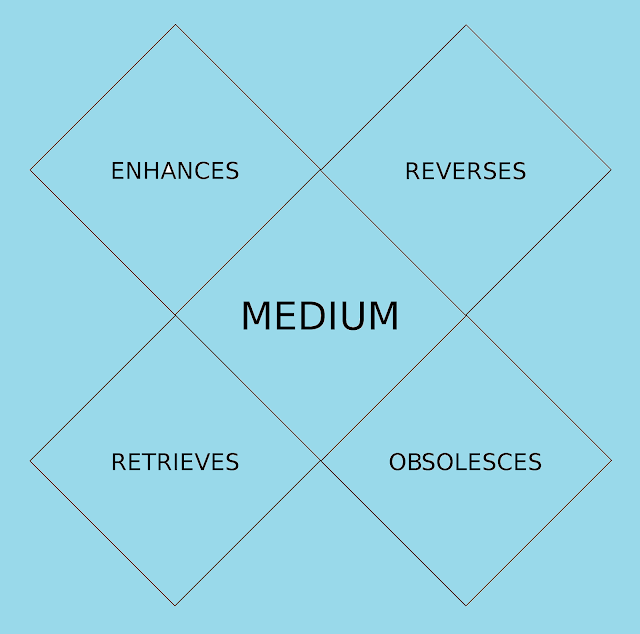 Then I suggest you should watch Marshall McLuhan’s lecture: The Medium is the Message (1977, part 1, 2 and 3). Among other issues, he talks about the relationship between literacy and media. He also talks about the search of identity through violence and suggests dialogue as an alternative quest for identity. Apparently, in the ideal GIF, you can’t tell the beginning of the loop from its end. Well, in these animated GIFs, you can easily distinguish the beginning and the end. Yet I think they fulfil my goal: to pass negative judgement on the repeated actions. You’ll see that, in a way, the two animated GIFs summarise the main events in the video. 1. Download Squared 5 MPEG Streamclip (choose the Beta version, which is compatible with YouTube) and GIMP and install them on your desktop. 2. Download the video of your choice from YouTube or Vimeo in MP4 format (make sure you select this format) using keepvid or PwnYouTube. If you’re in doubt, check out this tutorial for details on how to download videos from YouTube: Downloading YouTube Videos. 3. Create an animated GIF following the instructions in this tutorial: Creating Animated GIFs with MPEG Streamclip and GIMP. Some tips: according to Jim Groom, the animated GIF should be smaller than 1Mb. So check that you’re not choosing more than 10 layers and that the size of the image is appropriate (the bigger, the heavier!). Try out different settings till you find the one that suits your needs best. I did so and it worked! I know it takes time but you can’t have your cake and eat it. Credit: the technical stuff and links within this section were borrowed from Jim Groom and Alan Levine’s DS106 Participant Handbook. I strongly recommend you take some time and navigate Jim Groom and Alan Levine’s DS106. If you don’t like literature, you’ll get to like it. If you already like literature, you’ll get crazy about it! What’s more, the ideas and tools can be applied to the field of Knowledge Management (in education, health, business, etc.). For further ideas and resources about Knowledge Management, check out David Snowden’s site. What makes this activity particularly challenging is that you’ve got to establish meaningful, relevant connexions among 5 seemingly unrelated photos you’re randomly dealt out. To be honest, I’m not very creative. Some people can start writing about anything from scratch. I’ve never been able to do such a thing. At my first attempt on Five Card Stories, I tried to connect the most relevant ideas chronologically every time I picked out a photo. But this method didn’t work for me; I got stuck at the third turn. At this point, you might be interested in snapshot semiotics, so I suggest you should navigate this site: A Visual Cultural Study of Snapshot Photography, Landscape, and Tourism in the Contemporary American West. 1. Brainstorm ideas about the sequence of 5 photos as a whole (in the order they were given to you). Use these questions as guidelines: What’s the setting? When and where does the story take place? Who are the characters? What’s the turning point (problem, conflict or complicating event)? How can the problem be dealt with? What are the alternative solutions? What are the constraints on each possible solution? How does who affect what? Why does who affect what? Why is what affected by whom? 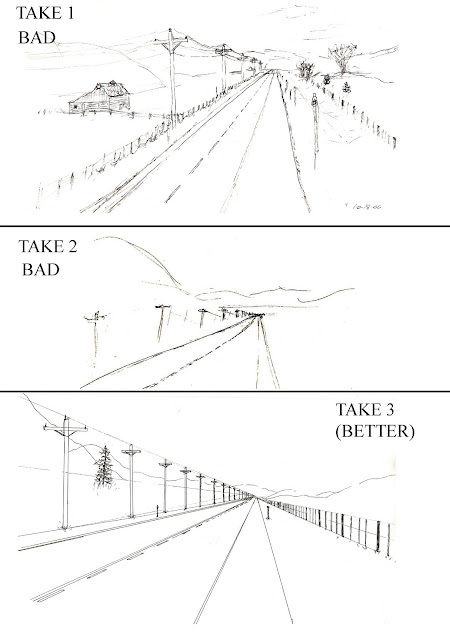 Which solution is the most appropriate according to what you want to convey? Why? Taking the story as a whole piece of writing, what’s your point of view? What attitude is conveyed throughout the story? 2. Discover your focal idea and point of view by non-stop writing the answers to the questions above. Get rid of what is not relevant. 5. Revise the content (check out that the whole piece of writing is coherent and cohesive) and re-draft if necessary. Just in case you haven’t realised, these writing steps are not part of a close linear process. They are meant to be followed in a spiral fashion in which as you make judgements about what you’ve written, you make adjustments to improve your piece of writing. It’s an open-ended (iterative) process. Well, you can see the outcome here and on Five Card Story: My Precious Gift. In this activity, I tried out Mozilla Popcorn Maker to superchange (i.e. enhance) a web video. Basically, you choose a video from YouTube or Vimeo and you add events (i.e. pop-ups) to it. The tool is actually quite easy to use, and on the website, there are some interactive tutorials, which I recommend doing before you have a go at this tool. By interacting with the tutorials, you’ll learn the basics. You can watch my pop-up video here and here. All this sounds very simple, but again, it’s not. As usual, seemingly simple things tend to be rather complex… I realised I’d made some mistakes when I read Susan Campo’s comments on Google+. 1. Carefully choose the video you want to remix and/or mash up according to your aims and your target audience. 3. Carefully choose the type of event (e.g. comment, speech bubble, thought, information, Wikipedia, photo, Twitter search, etc) you’ll add; “Variety is the spice of life.” If the audience have to read a long piece of writing, you should consider inserting a timed pause. 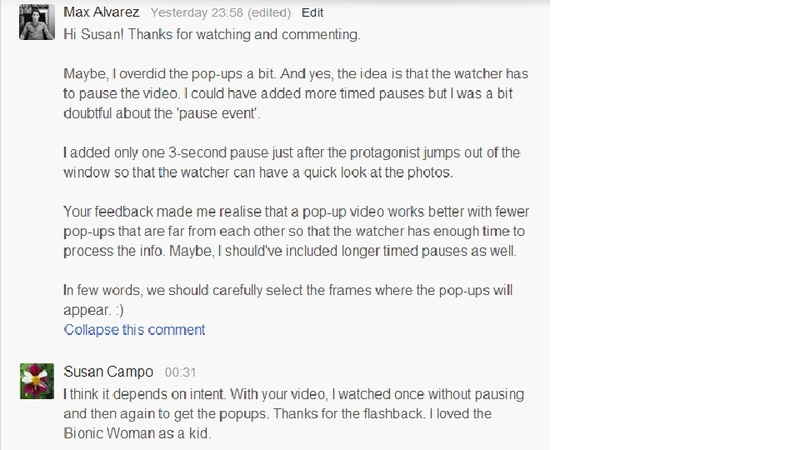 You should also consider warning your audience that they’ll have to pause the video at different times. Then, Laura Hilliger suggested that I should watch ‘Buffy vs Edward: Twilight Remixed’, a video remixed by Jonathan McIntosh. I recommend watching the ‘original’ version of the video first. Basically, it’s a kind of argumentative essay (thesis + antithesis) in dialogue format and synchronised actions. There’s a lot of food for thought on those videos. I’ll say no more; just watch the videos and draw your own conclusions. They’re simply awesome. Finally, as I was revising this post, an interesting video by Amy Burvall came out. I couldn’t help noticing how careful Amy was about crafting the mise-en-scène. 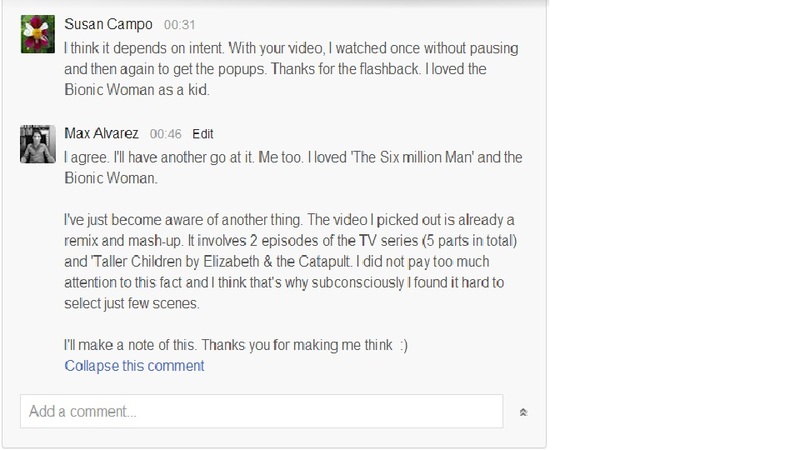 Some days later, Amy decided to superchange her video into this pop-up video. As I was watching the enhanced version, I realised that in order to create a multimodal text, you need to be aware of the grammar that governs each semiotic mode and how these rules can be successfully flouted in order to create a new shade of meaning in a remix or mash-up. Undoubtedly, this is a digital literacy that needs to be developed. In connexion with this, these resources based on films can be useful to design storytelling activities that help to develop digital literacies (More resources here). As regards Marshall McLuhan’s quote “We shape our tools… and then our tools shape us” and Amy’s cyborg style on her video, watch these videos about real bionics (Human Prosthetics for Paralysis: Richard Andersen at TEDxCaltech & Human Prosthetics for Paralysis: Joel Burdick at TEDxCaltech). Now, what do you think? 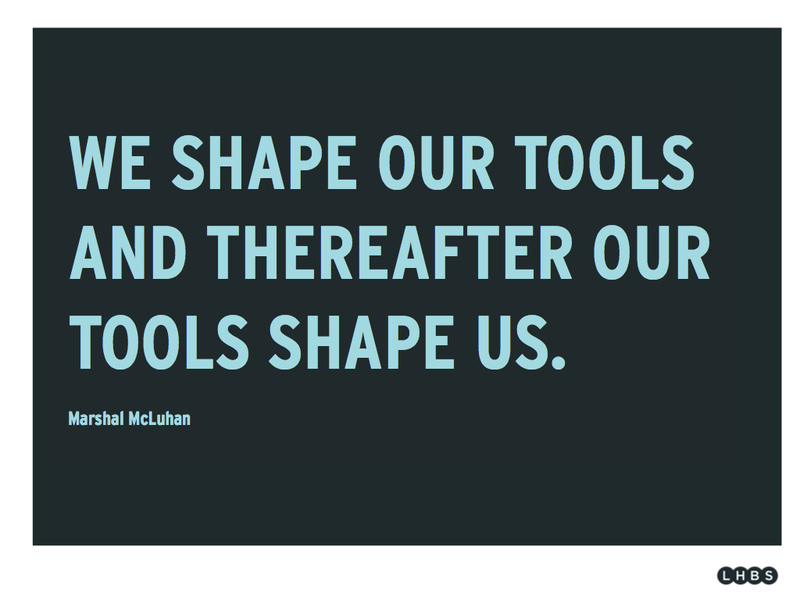 How do our tools shape us? "Photographs are as much an interpretation of the world as paintings and drawings are" (Susan Sontag). ¨thinglink.. is a web 2.0 tool that allows you to enhance a photo by adding links to it. In this activity, I chose a photo of a historical building from Compfight (you can also do so from Flickr or Wikimedia Commons) and added links to relevant information on Wikipedia, videos on YouTube and other photos on Flickr. Basically, the idea is to add more information about the represented participants (i.e. the people, places, things depicted in images). Thus, the story behind the image (what was hidden in the photo) becomes visible and public in the enhanced version. The tool is very easy to use. You can read the post with the photo I enhanced here or go directly to the photo here. 1. Carefully choose the photo you want to enhance according to your aims and your target audience. At this point, you might need to read Daniel Chandler’s Notes on 'The Gaze', Kress & van Leeuwen’s Chapter 4 Representation and Interaction: Designing the Position of the Viewer (2006: 114-153) and George Carey Simos’ Are Photographs Copies of the World? 2. Carefully choose the information sources you’ll link to the photo. If it’s meant to be historical, scientific or factual, do your best to strike a balance (among type of sources and points of views). “Less is more.” + “Variety is the spice of life.” At this point, you might need to read Daniel Chandler’s Semiotics for Beginners: Intertextuality here. However, you’ll easily notice that I didn’t follow these rules to the letter in the photo I enhanced. The first problem I came across was that I had to heavily rely on Wikipedia because the more academic resources (books) about Remedios de Escalada (the place), Remedios de Escalada (the person) and Edward Banfield are copyright materials and can’t be used. The same thing holds true about the photos of Remedios de Escalada published on Flickr; most of them are copyright. I chose a photo that was taken from the footbridge at one end of the railway station; the only place where you can take a photo of the building. This choice of location affected the horizontal angle, which conveys the degree of alignment between the interactive participants (i.e. the producer of the image and hence also the viewer) and the represented participants (in this case, the building and the carriages), and the vertical angle, which conveys the power relationship between the interactive participants and the represented participants. Notice how the oblique angle conveys detachment from the represented participants, while the vertical angle is interpreted in two ways. The high angle conveys that the interactive participants have power over the carriages but the eye level angel conveys that there is no power difference between the interactive participants and the building. Another problem was that I had to leave out some interesting videos (Historia de los Ferrocarriles Argentinos 1, 2 & 3, in Spanish) because they were strongly biased and were of very low quality. I added a link to an educational resource with seven 28-minute videos. But mind you, these videos are strongly biased. I also added links to a documentary video in which a railway worker talks about his job passionately (it’s in Spanish) and videos about the local interactive railway museum, library and club. I think this type of information gives us a quick glimpse into the people that live in this city. In a way, these people now become part of the represented participants in the enhanced image. To sum up, the main problem in this case was not the tool, but the topic itself. It’s unfortunate but some parts of the history of my country are highly controversial. Sometimes, it’s extremely difficult to tell what was real and what was just made up to be published as the official history textbook. As a teacher, I must be aware of how the choice and use of the sources and tools help to convey certain political messages. The choice of sources and the way information is presented overstate some issues and understate others, conveying certain ideology. Anyway, this has been a good opportunity to develop critical thinking skills (esp. analysing and evaluating). “Access to many media empowers only those who know how to use them. We need to go beyond skills and technologies. We need to think in terms of literacies” (My emphasis). He goes onto describing five interconnected literacies (i.e. 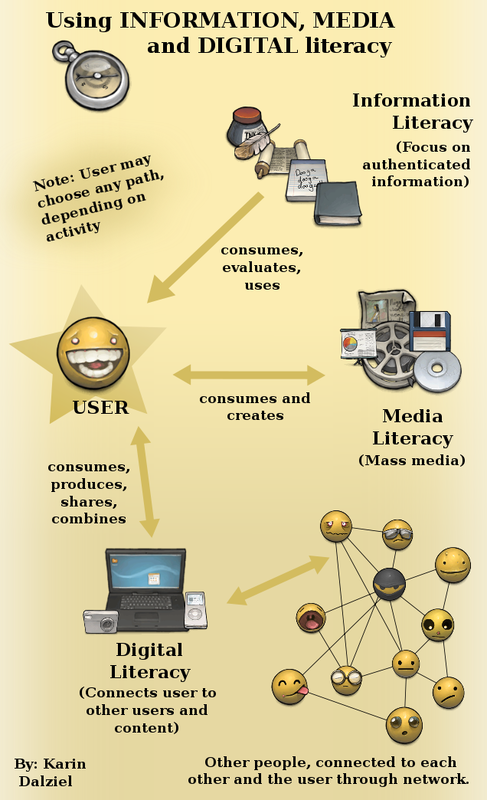 attention, participation, collaboration, network awareness and critical consumption) that must be developed in an integrated way (For a description of each literacy, go to Attention, and Other 21st-Century Social Media Literacies. For further discussion, watch this Blackboard Collaborate presentation: T3S2 – Literacies of Attention, Crap Detection, Participation, Collaboration & Network Know-How). For the sake of space, I’ll just focus on how these literacies were developed in the storytelling activities I did by picking out some relevant examples. 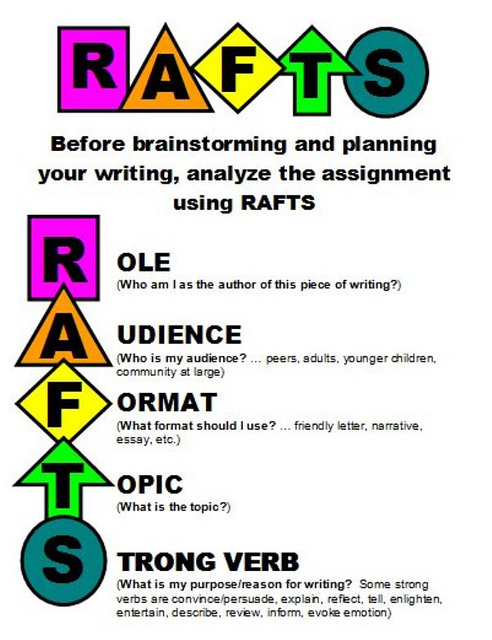 I’ll also suggest some activities that can be designed to cultivate these literacies. Attention becomes an issue when watching a pop-up video and ‘reading’ the enhanced photo. The viewer/reader has to decide what to pay attention to and what to (momentarily) block out. So attention could be developed by designing an activity (based on these resources) in which the viewer/reader has to find (global) information (skimming different semiotic modes) during the first watching/reading, within certain time limit. Another activity could involve finding specific information in the pop-ups/links so that the viewer/reader has to choose the type of pop-up/link which they will scan beforehand. Finding detailed information in the pop-ups will imply flouting some grammar rules of this particular visual semiotic mode; that is, the video will have to be paused, rewound and or fast-forwarded (Cf. a film/video is meant to be continuously moving forward, from the beginning to the end). Then, by asking the viewer/reader to make a pop-up video and/or enhanced photo, critical consumption, participation and network awareness can be developed. To ensure this activity is successful, a set of criteria about the relevance of the theme chosen and the validity/reliability of the sources should be agreed upon beforehand. For instance, if the pop-up video or enhanced photo is about a historical monument, which monument should be chosen? Taking account of the gaze, the size of frame, the horizontal and vertical angles, which photo should be chosen? Why? What for? How will this enhanced video/photo contribute to the learning experience of others? Then, there should be some balance between primary and secondary sources of information, and between facts, points of view and opinions. If these activities are carried out applying appropriate techniques of group dynamics (e.g. each member of the group has a well define role to play and they are expected to swap roles at certain times), participation and collaboration are also developed. 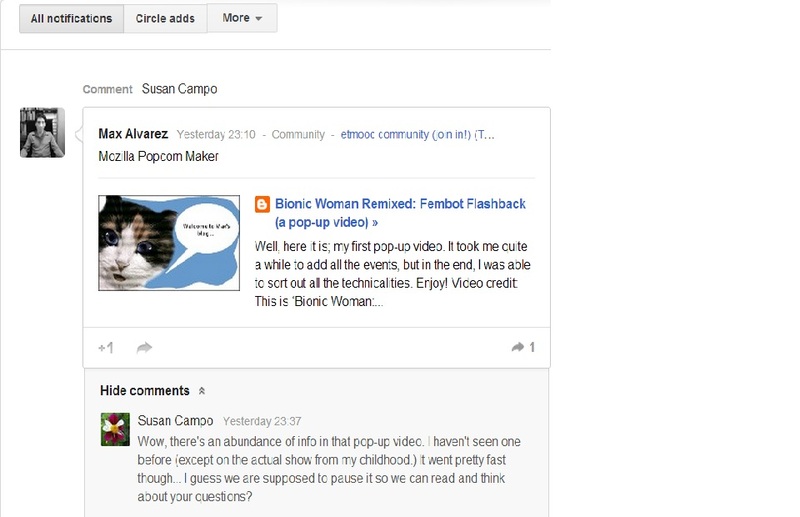 The remix button in both Mozilla Popcorn Maker and ¨thinglink.. seem to be useful to encourage these literacies. Yet one key issue here is how successfully we can set relevant, meaningful purposes that help to contextualise each activity. That is, ideally the activities should have a real-life purpose to have face value. We must consider what people usually do in real life (i.e. both in the analogical and digital world) and how the development of digital literacies by deploying digital technologies can enhance those practices. Otherwise, we’ll be just practising (i.e. in the sense of meaningless drilling). We’ll run the risk of, in Marshall McLuhan‘s words, letting the tools shape us without even noticing potentially negative side effects. For instance, as a real life application in professional development programmes, digital storytelling activities can be used to help professionals identify what they know and reflect upon their decision-making procedures in their own (complex) context (For further ideas, read: Storytelling: An Old Skill in a New Context). These activities can also be used to help professionals revise and (re-)conceptualise their own cognitions/representations of learning in a digital age (For further ideas, watch Las Narrativas Docentes en Entornos Digitales) and they can make the learning process open, public and transparent. Another important issue raised by digital literacies, as discussed by Dr. Doug Belshaw, has to do with the features of these literacies; they are subjective (i.e. ideological; temporarily constructed in an active relationship with the socio-cultural world) and highly context-dependent (i.e. they are developed in response to changes in the context, so they are defined and redefined as the context changes over time). Belshaw argues that these characteristics, together with academics’ taste for umbrella terms (i.e. vague general terms used as superordinate terms), explain the pervasive ambiguity in the use of the concept (either in singular or plural) to mean different things. In his doctoral thesis, he suggests that these problems can be overcome if we start to conceptualise digital literacies (plural) as a heuristic or matrix (i.e. in the sense of a womb; not in the mathematical sense) of eight essential elements (i.e. cultural, cognitive, constructive, communicative, confident, creative, critical & civic) applying a continuum of ambiguity to avoid circular discussions about umbrella terms and applying third-party definitions to specific contexts (Belshaw, 2011: 95-112, 206-219 & 221-224). Based on Quine’s web of beliefs (i.e. all our beliefs, which are always subject to potential revision, are arranged in a web in which the ones firmly anchored at the centre are mistakenly taken for granted), Belshaw claims that some of the eight essential elements of digital literacies are more central than others in certain contexts and that, since we operate in different semiotic domains within the digital sphere, it may be more appropriate to apply McLuhan’s tetrad of media effects to these semiotic domains and affinity spaces (ibid. : 139-143, 201-203). That is, the tetrad can help us determine which of the eight essential elements of digital literacies are more salient in a given context, leading to a more accurate definition of digital literacies. I must confess that I was tempted to apply the tetrad to the semiotic domains involved in the use of the digital storytelling tools above. It would have been interesting to see what patterns emerge… and it would have rendered even a much longer post. Context and culture are two notions that are quite pervasive in the sources we’ve been working with in #ETMOOC. However, I haven’t come across a single explicit definition of any of these terms. Every time I come across these concepts, I wonder what context we’re talking about and what conceptualisation of culture is implied. Are we talking about the environment or the circumstances, in a broad or narrow sense? That is, are we referring to a concept akin to the context of situation [i.e. the immediate physical, spatial, temporal, social environment in which verbal exchanges take place (Kramsch, 2000: 25-26, 126)] – a narrow sense – or the context of culture [i.e. the members of a social group that has a broadly agreed set of common public goals and purposes in its use of language share a set of historical knowledge, beliefs, attitudes and values that that contribute to the meaning of their verbal exchanges (ibid.)] – a broader sense – as defined by Bronislaw Malinowski? I’m not suggesting that we should use these concepts and definitions (which have to do with language studies); I’m just pointing out that we should consider that each context has specific features that define it. In other words, when we’re referring to the digital sphere or the digital world as a context, which are the features that define this digital context? Does this digital context include culture (a kind of context of culture)? Or does culture include the digital context? What is the role of the digital context? Is it a variable or a category of analysis? Both? In La Importancia del Contexto, Diego Leal discusses how individual factors (e.g. an individual’s background and mindset) could affect – much more than we think about – what we do and think. He suggests that we should learn about ourselves through introspection and include these individual factors in what we call context. What do you think? The following questions contain the highly vague and ambiguous term context. As digital literacies develop, which cognitions (i.e. 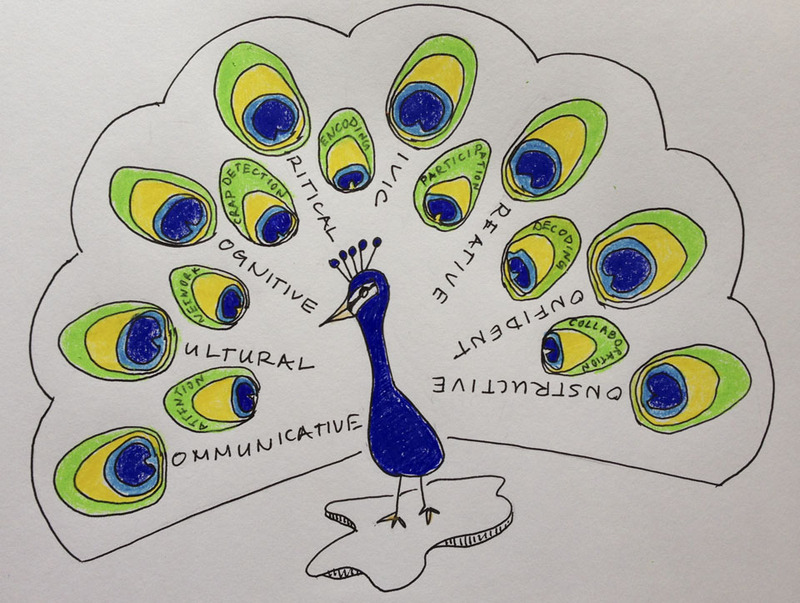 ideas, beliefs, values or emotional reactions) or social representations are at play in each context? Which artefacts are considered valid in each context? By whom? Why? To what extent communication technologies and devices are fairly distributed in each context? Who has open/free access to all of them? To what extent is the how-to knowledge accessible to everybody? What status is given to learning by making mistakes in each context? To what extent is this way of learning considered valid? Why? How is this way of learning validated? By whom? To what extent are creativity and its development taken into account in the curriculum of each context? To what extent is the learner allowed to push the boundaries? To what extent do teachers reflect upon their own decision-making procedures? To what extent are they encouraged to do so? How does their context (e.g. working conditions, available resources, hidden curriculum, school community ethos, interaction with authorities, peers and students, etc.) affect their practice? To what extent do educational policies encourage or sustain the emergence of opportunities to innovate? Belshaw, D. A. J. (2011). 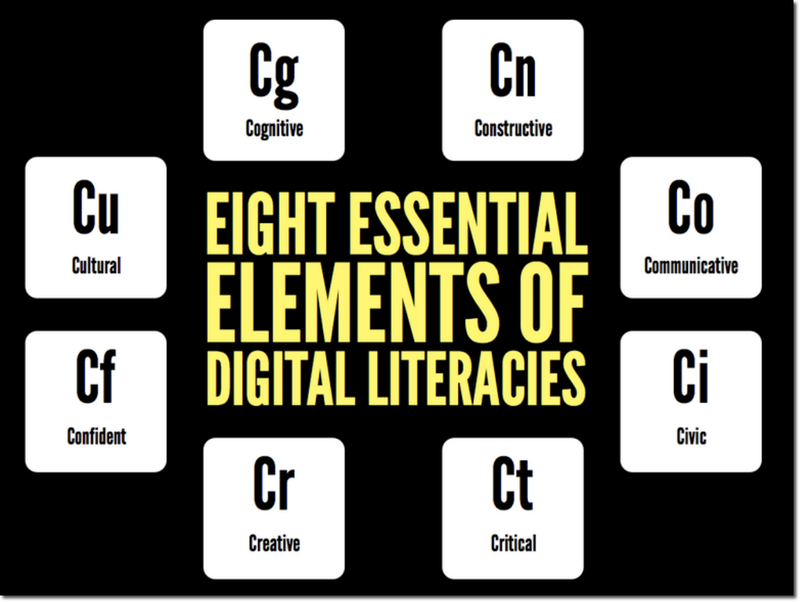 What is 'digital literacy'? A Pragmatic Investigation. Durham theses, Durham University. Available at Durham E-Theses Online: http://etheses.dur.ac.uk/3446/ or doctoral thesis. Kramsch, C. (2000). Language and Culture. Oxford: Oxford University Press. Kress, G. & T. van Leeuwen (2006). Reading Images. The Grammar of Visual Design. 2nd edition. London: Routledge. Labov, W. (1972). Language in the Inner City. Oxford: Basil Blackwell. McCarthy, M. (1997). Discourse Analysis for Language Teachers. Cambridge: Cambridge University Press. Toolan, M. (2009). Language in Literature. An Introduction to Stylistics. London: Hodder Education.